Happy to say that we cooked together this week! We planned on cooking last week, but a large argument got in the way and we were both so tired after arguing that it just wasn’t going to happen. But that’s what this is all about…finding a way to build our relationship. Sometimes these difficult experiences help us understand better what it is we are after. And this Enchilida Casserole was worth the wait!! This colorful dish packs a punch with flavor and is loaded with so many high-powered nutritious ingredients! And of course it’s easy to make. Put the oil in a small sauce pan over medium heat. Add flour stirring constantly for a few minutes. Stir in the tomato paste and then broth. Whisk until smooth. Bring to a simmer over low-medium heat. Stir in salt to taste and continue simmering until thickened, about 5 minutes. In a large saucepan add 2 cups water and 1 cup quinoa and cook according to package directions. Set aside. Lightly oil an 8×8 or 2 quart baking dish. 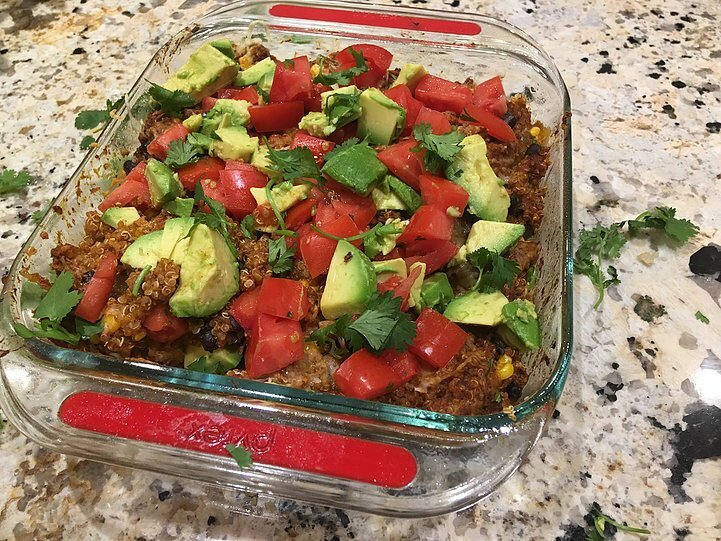 In a large bowl, combine quinoa, enchilada sauce, green chiles, corn, black beans, cilantro, cumin and chili powder. Spread quinoa mixture into the prepared baking dish. Top with remaining cheeses. Place into oven and bake until bubbly and cheeses have melted, about 15 minutes. Garnish with diced avocado and tomato. Enjoy!